The former chief executive of the carmaker Volkswagen has been charged in Germany over his involvement in the company's diesel emissions scandal. 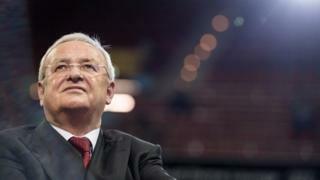 In a statement, prosecutors accused Mr Winterkorn of a "particularly serious" fraud, as well as a breach of competition laws. They also accused him of approving a "useless" software update designed to conceal the true reason for the cars' higher emission levels. Last month, the US Securities and Exchange Commission (SEC) sued Volkswagen and Mr Winterkorn, accusing the carmaker of "massive fraud" over the emissions scandal. VW's current chief executive Herbert Diess told the BBC he believed the company was "over the worst" of the Dieselgate fallout, but said that it still had to win back the confidence of its customers.